Maintaining your vehicles tyres in a top-notch condition is vital for your personal safety. Despite the tyre manufacturing quality and mount mastery are, without a doubt, crucial, most tyre failures happen because of misuse. Even high-quality tyres can do a bad turn because of a human factor. To prevent all possible risks, it is essential to follow your tyre dealer’s tips. In this article, we are going to share recommendations of the leading dealers of affordable high-performance tyres in the UK: giga-tyres.co.uk and tyres-outlet.co.uk. The fact that every tyre wears out over time is natural and inevitable. It is a result of constant friction against the road surface which actually makes driving possible. 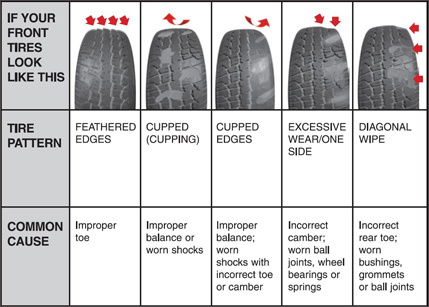 Factors that impact tyre wearing are many. In order to detect yours, you should do regular inspections of your tyres’ surface. Every wear pattern flags about misuse and potential risks. One-sided wear can be a sign of a wheel misalignment. You should also check the wheel for damaged front-end mechanical parts. Such one-sided wears lead to tyres degrading faster and can cause a decreased steering response. Centre wears, which are usually a result of over-inflation, expose you to even greater risks: not only do you wear tyres faster, but also you can face serious problems with traction and braking, as well as a stronger chance of a blowout (because bald zones on tyres worsen the heat dissipation). If you have noticed both-sided wears, it means that your tyres are systematically under-inflated; this eventually shortens the life cycle of your tyres and makes you spend on petrol more (+15%) because your engine must work harder. Diagonal wears on rare tyres are symptoms that the wheel is toed-in/toed-out or you overload the cargo part of your vehicle. Make sure you never exceed the tyre load rating prescribed for your car. It’s crucial that you solve issues that caused the wear before replacing badly-worn tyres with the new ones. If you keep driving on the worn ones, you risk turning them into bald tyres (when the tyre’s tread is totally worn down). A bald tyre doesn’t have grooves on its surface, which are responsible for evacuating water from under the wheel when it rains and providing an appropriate traction with the road this way. Using bald tyres is illegal because, on the wet road, you can have hard times braking and controlling your vehicle and potentially cause a severe car crash. Dry weather doesn’t free you from nuisances of using bald tyres as well: one of the reasons why people get a punctured tyre is the excessive tread attrition.